Designing the frame, rack and fenders together results in superior performance: lighter, stronger, more seamlessly integrated and ready to tackle the commute day-in and day-out. The single-bladed rigid Lefty is pure functional simplicity, blending light weight with exceptional stiffness and strength. Rider tailored geometry. A simple, clean and functional kickstand is integrated into the rear dropout. Cannondale's legendary aluminum craftsmanship is evident in the smooth welds, elegant tube shapes and overall attention to the smallest details. The Contro1 is a superb urban bike down to the last detail. It has an uncluttered look that’s very refreshing. 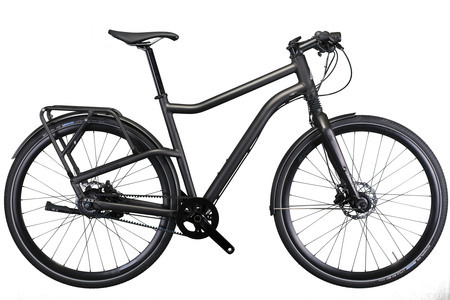 Furthermore, as judges we like the fact that in this case the manufacturer has placed high priority on the design of a normal bike without an “E” in the product’s name too.